2017 Advocacy Days are Here! If you're reading this newsletter, it’s probably safe to assume that Early Intervention/Early Childhood Special Education (EI/ECSE) services have impacted your life in a positive way. If so, your advocacy in support of these services is needed now more than ever! 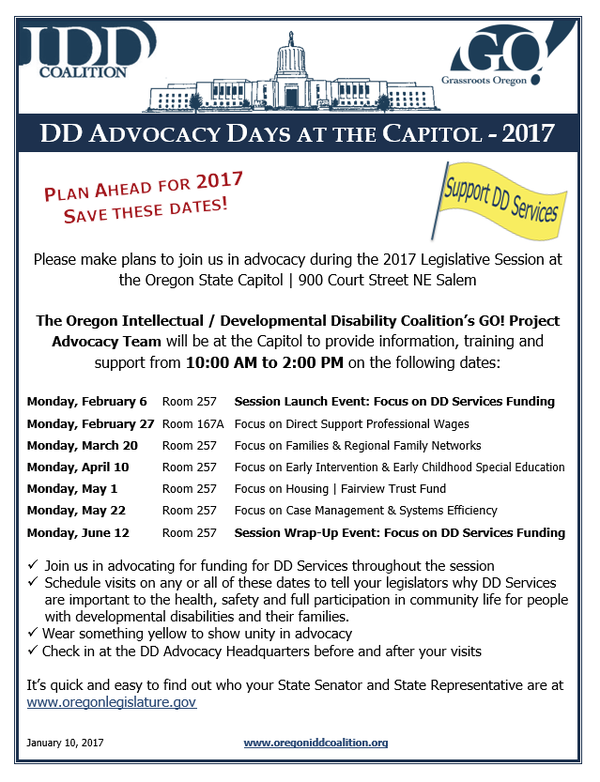 The 2017 Oregon legislative session starts this week, and we need YOU to take action in support of the programs and services that impact your life. Our legislators want to hear from you and benefit from your experience, so write an email, make a phone call, or give testimony at a legislative hearing! Senator Sara Gelser: "We need to hear your stories"
Oregon AEI was privileged to ask Senator Sara Gelser to share her thoughts about ways parents can get involved in advocating at the state level on issues that are important to them. Oregon AEI: How did you get involved in advocating on behalf of people with disabilities? Sen. Gelser: The day before my 21st birthday, I gave birth to my oldest child who was born with physical and developmental disabilities. Through the first years of his life, it became clear to me how much economic, educational, and health care privilege impacted his ability to make progress and exceed expectations. Oregon AEI: Families are growing concerned about news re: to budget cuts hitting the newspaper. How can they take action to share their concerns? Sen. Gelser: Families need to work together to prioritize around the budget. Unfortunately, without new revenue we will be facing significant budget cuts. We need to be honest and thoughtful as we prioritize which services are most important to the health, safety and dignity of people with disabilities and their families. A coordinated message developed and delivered in collaboration with other partners in the disability community will help advocates be as effective as possible. Congratulations to Clatsop County! The U.S. Department of Education recently announced that Clatsop county will receive $350K to implement a pilot project called Preschool Pay for Success. Our son was diagnosed with autism in 2005 at the age of 3.5, and we decided to enroll him in an MECP classroom at the urging of the evaluator. It was a tough decision; he'd been home with me or spending time with a family friend who had become like a grandparent to him. Because we wanted him to learn his native (non-English) language, we hadn't had the opportunity to spend time with other children his age. At the time, he was eligible for three mornings in an MECP classroom where he spent time with children experiencing disability and typical peers. Click to read "Remembering When"
Have a success story of your own? We'd love to hear from you! We'll be featuring stories about how EI/ECSE programs have positively impacted families in upcoming issues. Southern Oregon Association for the Education of Young Children is holding a winter conference in Medford. Find out more here! Save the date for the Division for Early Childhood's 33rd Annual International Conference on Young Children with Special Needs and Their Families! it will be taking place October 4-6, 2017 in Portland this year. Read more about this year's theme, "Mountains of Opportunities: Interdisciplinary Collaboration in the New Millennium." Podcast, "Early Learning at OMSI"
Children's Institute’s podcast producer Rafael Otto visited the Oregon Museum of Science and Industry. There he spoke with OMSI’s Annie Douglass, the museum's early childhood education manager, about how play can stimulate learning about the science process as well as the growing role of museums as early learning access points. The goals of the Oregon Association for Early Intervention are twofold: to increase public awareness about the critical need for early diagnosis and care for children with disabilities, and to advocate on behalf of early intervention.